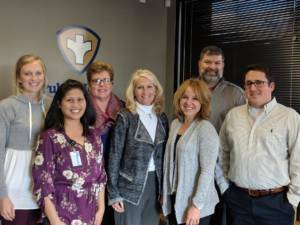 The dedication of Dubois County leaders to improving the health and quality of life of its citizens has earned it the Indiana Healthy Community designation from the Wellness Council of Indiana (WCI). Indiana Healthy Communities is an evidence-based collaboration process designed to help communities focus on implementing and sustaining a culture of health and well-being to spur economic vitality. Through this process, WCI helps communities assess their programs, services and infrastructure in four areas: health, economy, environment and community. Communities use data from the WCI assessment and other sources to determine needs and then develop a Healthy Community Action Plan with clear goals and objectives. There is a strong emphasis on healthy workplaces and employer involvement as the initiative uses the community health conversation to drive economic vitality. Dubois County Visitors Center and Tourism Commission, Jasper Engines & Transmission, Purdue Extension, Memorial Hospital and Healthcare Center, the Dubois County Health Department, the Dubois County Board of Commissioners, and the Dubois County Community Foundation. The coalition is already working on the goals it set for its two-year designation. It will focus on recruiting more employers in the community to go through the AchieveWELL process, establishing the Supplemental Nutrition Access Program (SNAP) in area farmers’ markets and using information gathered on a community audit led by the Indiana State Department of Health to inform a new comprehensive plan for the city of Jasper. Dubois County will be formally recognized at the 2019 Indiana Wellness Summit on September 17, 2019. The coalition will be hosting a community celebration event to recognize community partners and AchieveWELL organizations. Read more about the county’s efforts (and others across the state) in this 2018 BizVoice story. Learn more about Indiana Healthy Communities and how your community can start the recognition process at www.wellnessindiana.org or contact Madie Newman.